Under the 1987 Montreal Protocol, the manufacture of CFCs - used in fridges and aerosols - was ended in 2010. 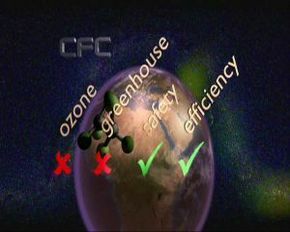 But in this programme we find that some of the ozone-friendly replacements to CFCs are in fact super greenhouse gases. By 2050, up to a fifth of the greenhouse effect could be caused by these substitute gases. There are alternatives that are ozone and climate friendly. So could the Montreal Protocol be used to control a huge chunk of the projected greenhouse gas build up?